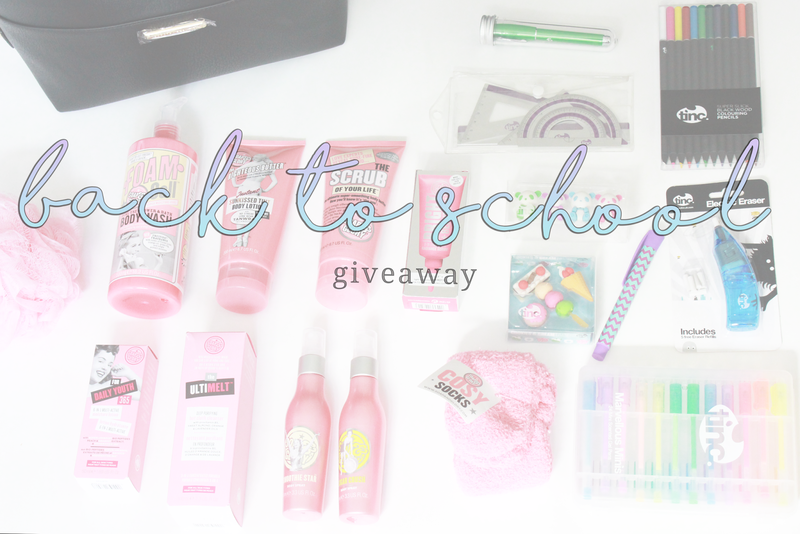 BACK TO SCHOOL SUPPLIES HAUL AND GIVEAWAY! Stationery shopping is my ultimate favourite, I will forever love buying new pens and pencils! 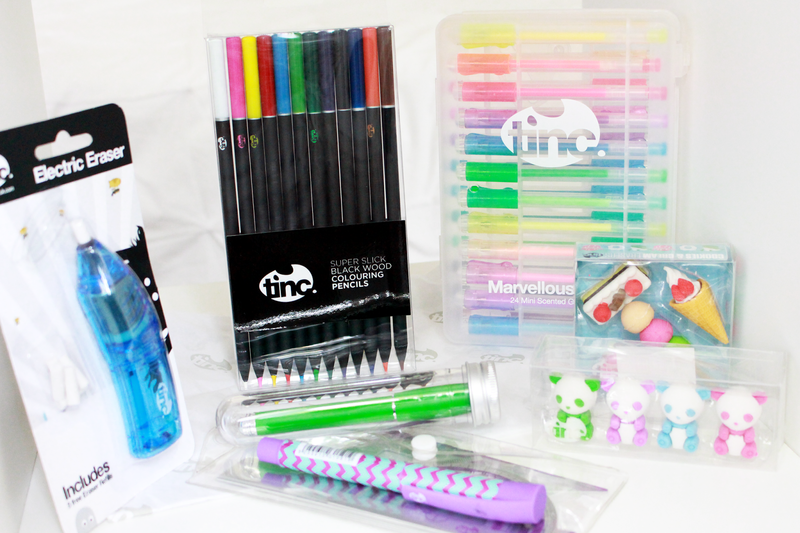 I found that Tinc are the best place to find unique and extraordinary supplies and gadgets for all ages. You can buy online or find a local store near you through their website. Marvellous Mini's Scented Gel Pen Set - this set comes with 24 different gel pens and a strong case to keep everything neat, I think these are helpful for making pretty notes and they're scented! Aluminium Geometry Set - everyone needs one of these in school, so this set would become extremely useful. Electric Eraser - this is one of Tinc's most famous product, it moves fast and effortlessly leaving no marks, smudges or holes in your paper - I didn't even know electric erasers existed! Metal Fountain Pen - I don't know about anyone else but I remember having to learn how to write with these in school! Scented Cookies & Cream Erasers and Panda Erasers - these two eraser sets look as good as they smell - I love that Tinc have scented products as it makes them so much more exciting! 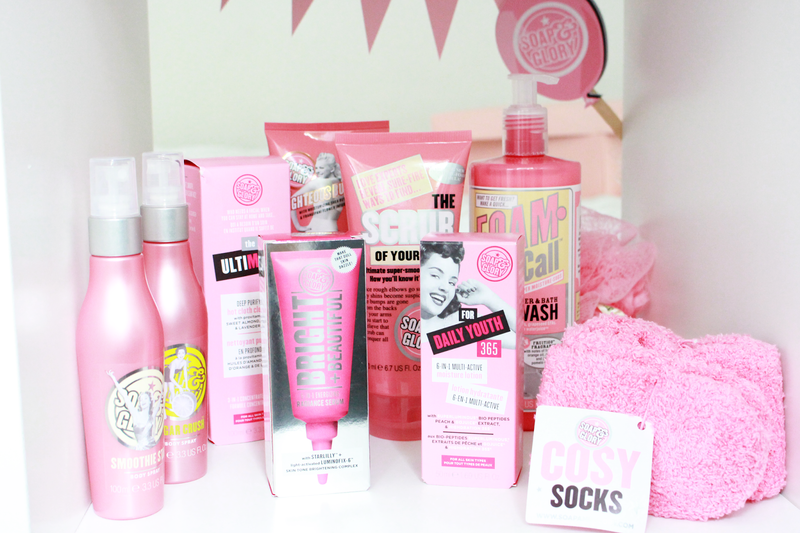 Soap & Glory have made getting ready in the morning less of a chore with their collection of bath and body products. Foam Call Bath & Shower Body Wash - this body wash will leave you smelling amazing in the morning! Shower Puff - to go along with the body wash, it's big, pink and creates the most amazing bubbles! The Righteous Butter Tinted Body Lotion - to create glowing skin and a natural sunkissed tint with no streaks and smells amazing! The Ultimelt - a deep purifying hot cloth cleanser, to detox your skin with provitamin B5, sweet almond, orange and lavander oils - suitable for all skin types! Bright & Beautiful Energy Boosting Radiance Serum - it blurs dark spots and brightens the skin instantly! For Daily Youth Moisture Lotion - the 6-in-1 formulation has firming, toning, soothing and rejuvenating benefits for your skin! Cosy Socks - and some amazing Soap & Glory cosy socks to put on after a hard day at school! DO YOU WANT TO WIN EVERYTHING I HAVE MENTIONED ABOVE? this competition is open to UK residents only - sorry to international readers! if you enter any of the optional entries, I will be checking you have done them! My favourite subject in school is maths. And I really love your YouTube videos. More people really need to subscribe!!!! I LOVE Drama and ICT. My favourite subject is art or French! My favourite subject is either Art or French! My favourite subject is P.E or Art! My favourite subject in school was Art & Design. I had a really fun time with painting and designing. My favourite subject is maths all the way! OMG I love every product you've brought !!!!!!!!! my favourite subject in school is pe ! !